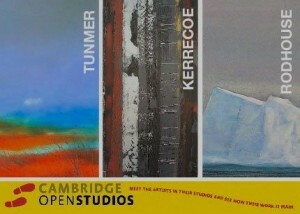 July is just around the corner which means that Cambridge Open Studios 2011 is not far away. The editors at City Connect absolutely love this time of year as we are treated to some amazing works of art and, along with the public, are kindly invited into the homes of the artists themselves. For those of you who have yet to discover Cambridge Open Studios, it is an event which allows artists to collectively work together in the centre of Cambridge and some surrounding towns and villages. More often than not, you will be invited into the artist’s home and will be able to buy pieces you fall in love with even if they are not showing them in a working studio or exhibition. To add to the magic of Cambridge Open Studios, you’ll be pleasantly surprised that some of the artists go the extra mile and offer you tea, coffee, wine or nibbles as you explore their beautiful works of art in a relaxed and friendly atmosphere. The added bonus is that the artists themselves are on hand to talk to yo about their work and in some instances commission you your very own piece. Cambridge Open Studios is often talked about as one of the highlights of Cambridge’s artistic year. You will undoubtedly be inspired and see some outstanding paintings in addition to other works of art such as batik painting, ceramics, pottery, drawings, illustrations, glass, furniture making, painting, jewellery, photography, sculpture, textiles, digital arts, wood carving, enamels and much much more. To participate in Cambridge Open Studios, a good starting point is to pick up your free guide book which can be found at various venues around the city of Cambridge. This guide book is bright yellow and hard to miss and this year it boasts 240 artists and groups taking part at over 178 venues across the city and villages. For those of you new to Cambridge, the Cambridge Open Studios guide book includes a map to make finding all the studios as easy as possible. Please note that not all artists display their work on each of the first four weekends of July when Cambridge Open Studios takes place. To avoid disappointment and to make sure the artist of your choice is exhibiting work on your chosen date, please visit www.camopenstudios.co.uk. Not that you need any more encouragement but Cambridge Open studios are free to the public. Just keep your eyes peeled for the yellow flags denoting participating artists and galleries so pop in and have a look. There is no pressure to buy at any time and you will often find the exhibitors are happy to talk about their work and inspiration. © 2011, City Connect News. Copyright Notice & Disclaimer are below. Tagged art, cambridge, events. Bookmark the permalink. Thanks for the Open Studios piece on your website. May I just point out that it only runs the first 4 weekends in July. This was such a great read. I really enjoy reading all your articles. Please write more article like this.